The original Lotus Elan sports car, designated the Type 26, was launched in October 1962 at the Earl's Court Motor Show in London, and was given the name Lotus Elan 1500. It was phased out in 1975, having evolved into a number of variants, the last being the Elan Plus Two. 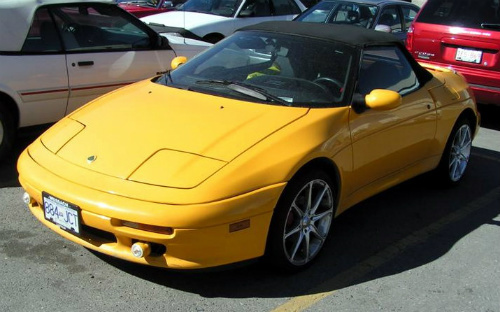 In 1986, the future of Lotus was secured when it was acquired by General Motors. However, the idea of a small convertible, with an outsourced engine, was still kept alive, and design work began in 1986. Consequently, in August 1989, the Elan was re-launched, at the Motorfair in Earl's Court London, as the Lotus M100 Elan Series 1 sports car, having been designated the Type M100. The Elan was a two seater convertible, designed by Lotus' Peter Steven, and featured a fibreglass body on a steel chassis, with four wheel independent suspension. It was conceived as a mass market convertible, with the target market being the US. The M100 sports car was the first, and indeed the last, car with front wheel drive to be built by Lotus. Following its launch, press reaction was somewhat mixed, but it quickly gained the accolade of being "the finest front wheel car". It was powered by the 1588 cc, double overhead cam, 4-cylinder, 16 valve, multipoint fuel injected, Japanese Isuzu 4XE1 engine, with an alloy head and cast iron block, as used in the Isuzu Impulse saloon. Furthermore, as a result of it being extensively modified by Lotus, and fitted with an IMI turbocharger, the SE variant developed 165 bhp, with a 0-60 mph time of 6.7 secs, and a top speed of 137 mph. It had a five speed gearbox, and servo assisted disc brakes all round. Typical changes made to the Isuzu-Lotus engine included a new exhaust system, modified suspension, and upgrading the engine management system to improve torque. Unfortunately, the launch of the M100 coincided with the onset of economic recession in the UK and US, combined with the introduction of the Mazda MX-5 sports convertible, which was marketed on the nostalgic concept of the original Elan, whilst the M100 focused on new technology. Put simply, the Elan was regarded as the right product at the wrong time. Furthermore, sales of both variants were insufficient to recoup the massive development costs. Consequently, when Lotus was sold to Bugatti in 1993, the loss-making M100 was discontinued. Between November 1989 and July 1992, a total of 3,855 M100's were built, of which all but 130 were the turbocharged SE variant. A limited edition version, for the US market, featured a redesigned body with an alternative spoiler at the rear, a nose that was extended to comply with US regulations, and larger 16 inch wheels. A total of 559 units of this variant were built. Between June 1994 and September 1995 whilst Lotus was owned by Bugatti, a limited edition of 800 turbocharged Elan M100 Series 2 sports car units were built following the chance discovery of a warehouse full of surplus engines and gearboxes. This model was fitted with a new dashboard, the power steering was uprated, and the suspension was stiffened. Since, by this time, it was necessary to fit catalytic converters to the Bosal exhaust system, the power output of the Series 2 SE variant was reduced to 155 bhp, whilst the 0-60 mph time increased to 7.5 secs. The ABS system was only available on the Series 2 models. With improved build quality and uprated interiors, the Series 2 was a greater success than was the Series 1. When production of the Series 2 ended in 1995, Kia Motors of South Korea acquired the rights to build their own version of the Elan. 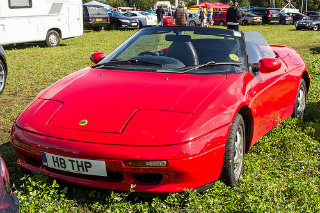 A 1989-92 Lotus M100 Elan in good condition would fetch within the region £5,000/$8,000 to £10,000/$16,000.